For some reason, I was hit by an obsessive need to clean out the six year accumulation of cooking magazines that had overtaken not one but two shelves of cookbook space in my kitchen. It’s not as if I’m awash in extra space anywhere in my house, especially in the kitchen! So, for a few weeks, I had a massive pile of plastic sleeves, torn pages, half-destroyed magazines and binders. 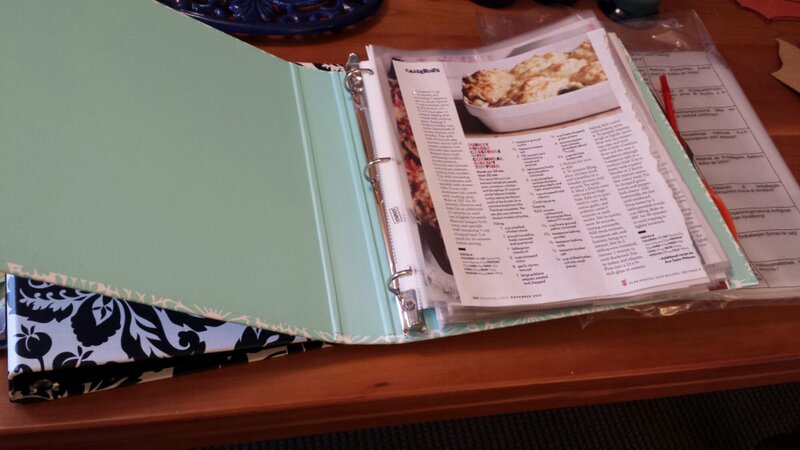 Then, one day, voila: three binders, with tabs and recipes grouped in a way that makes sense to me. Cue the relief. Wouldn’t you know it, not two days later I opened my mailbox and found – you guessed it – a new cooking magazine. As I type this update, I know that there are at least two more in my pile of magazines in the living room. My lovely system will need – sigh – some maintenance. Of course, I suppose I could just pass those magazines along to someone else without adding to my binders. I think part of the reason this project was so satisfying is that it was defined. I had a pile of magazines and I knew what I planned to do with them. Unlike a lot of our workplace challenges, I knew what was expected and had a clear outcome in mind. No conflict, no changing expectations, no wonder sliding recipes into neat, orderly plastic sleeves felt like a counter-stretch to the usual day. Working on this project also gave me time to sort out a few idea about how to capture that sense of satisfaction at work. In my case, it was the multi-year pile of magazines I’d been meaning to “do something” with for years. I picked a day to start the project and described what the end would look like: no more magazines, all the recipes I wanted to keep organized in binders. I think the end is important because we often fail to be clear about where we stop. Sometimes that end point is a hand-off to someone else, in which case we need to be sure they’re on board with our plan. Sometimes, we fail to recognize the “maintenance” phase of a completed project. If we do that, it can fall back in our lap (see below). This involved a trip to my favorite office supply store where, armed with a clear idea of what I needed, I wasn’t distracted by the endless options. Same goes for work: a team of creative people can pile on the great ideas until you lose sight of your product. Having a clear list of resources and and end point can help you be flexible but firm in getting your project complete. This can be the stumbling block. How many projects do you have in you list/head/space that you’re going to get to? And how many have a dedicated worktime on your calendar? I had to set aside time in the evenings to work on my project. I also kept all the supplies together in a bag (sleeves, binders, labels, markers, scissors) so it was ready to go when I was. Do you have a place for the materials and resources for your project? We all do it. We get up a head of steam, we start, and we get distracted. If that happens, rededicate some time or space in your life to get the project done. If you’re really having trouble completing something, ask yourself if it’s still worth doing? If so, are you the right person to do it? If not, can it be crossed off the list? Sometimes choosing not to do a project is a good choice. 5. Know how you’ll maintain the results. Will I cancel my magazine subscriptions? Or set a regular time to update my collection? I decided to let some of my subscriptions run out and to go through the sorting and collecting/discarding process a few times a year. If you don’t have a maintenance schedule, you may end up back at step one. How do you make it through a project you’ve been putting off?